Park Engineering thru the Blue Heeler Mining product line have proudly qualified & joined the Australian Made campaign. Independent research carried out by Roy Morgan in 2012 showed that almost all Australian consumers (98.8%) recognise the logo, and it is the logo which gives the vast majority (88.6%) of Australian consumers strong confidence that a product is Australian. Blue Heeler Mining has been acquired by family owned and run business Park Engineering, which is expanding by constantly investing in the best equipment and people. The precision machining, manufacturing and light fabrication business at 21 Industrial Road, Unanderra, has steadily made a name for itself since Jarrod and Kylie Van Elsland, of J & K Custom CNC Pty Ltd, purchased the business in 2006, a year after establishing their own company in a tiny shed at the rear of a machine shop in Kemblawarra. 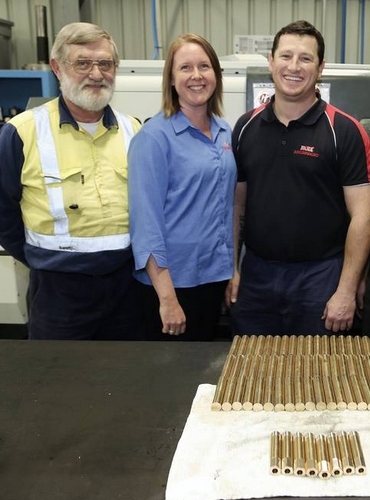 Park Engineering was located at Oak Flats when they acquired it, but since 2006 its CNC machine shop has steadily expanded at another location in Unanderra. The business now has a team of 13, including Mr Van Elsland's father Martin and his brother Shane. "When he [Jarrod] did his apprenticeship he just had an eye for it. He wanted to run a business himself," Mrs Van Elsland said. "He just bit the bullet and did it. We were having our first baby at the time and were in this tiny little shed out at Kemblawarra. They were tough times." It did not take long for the Van Elslands to expand Park Engineering, and the work increased when they went on the consumables list for BlueScope Steel. Now it has acquired Blue Heeler Mining, which manufactures for the mining industry. It has taken ownership on July 31 2014. Mrs Van Elsland said this meant they would expand their customer base. "A lot of our work has been with BlueScope and very local, so we are just trying to branch out into the mines," she said. "So Park Engineering will become the manufacturer of Blue Heeler products. "That business has a product that actually goes underground, and that is what we are buying. And we can machine the product that they put underground." The Park Engineering workforce would increase, she said. PICTURE: Martin, Kylie and Jarrod Van Elsland of Park Engineering. Blue Heeler Mining Goes International! Blue Heeler equipment has been used around Australia for over ten years, and is now also being used overseas! Equipment is presently been used in the Illawarra region, Sydney tunnelling projects, Newcastle and the Hunter Valley in NSW, Bowen Basin in Queensland and Kalgoorlie in Western Australia . And now we have gone international with our equipment being used in New Zealand.